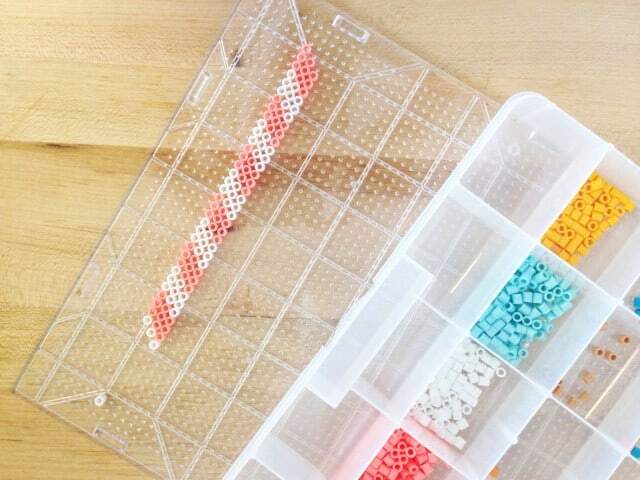 Have you ever tried hama beads, aka perler beads? 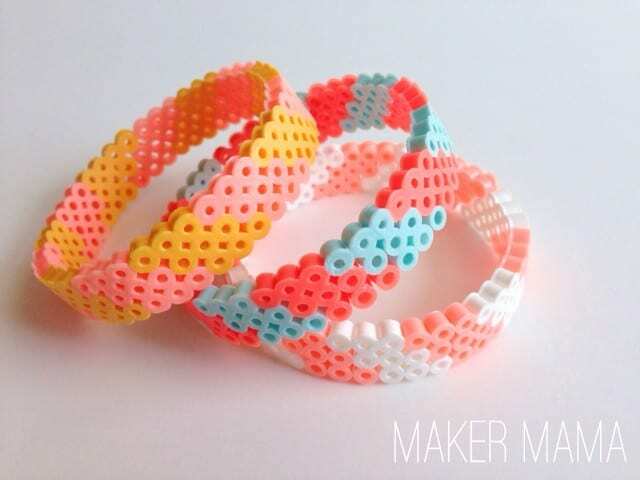 Learn how to make bracelets with beads in this tutorial. 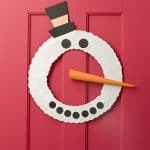 Easy and fun for adults or kids. Hi there! 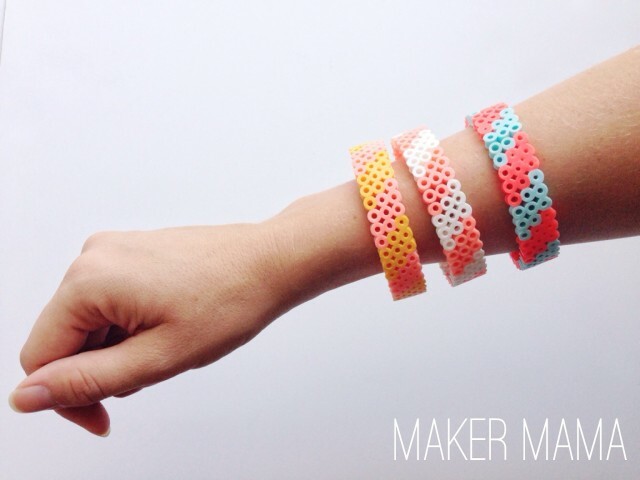 This is Amy from Maker Mama. 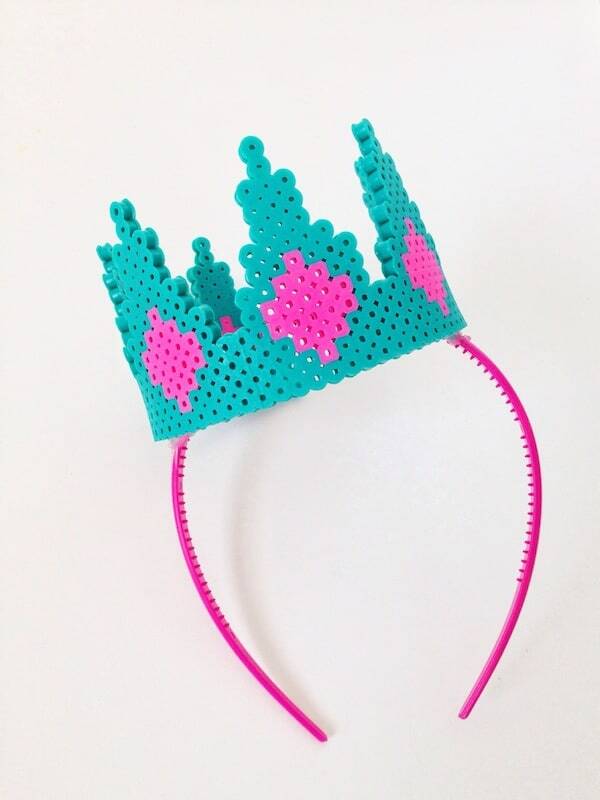 Today I’m sharing a how-to with one of my favorite materials: hama beads (aka perler beads). These Hama Bead Bracelets make a fun accessory for big and little girls alike, and you can make them in any color combination to suit your mood (or your outfit). 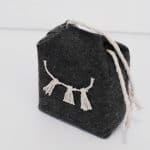 Check out how I did this easy bracelet DIY project. 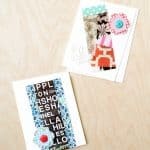 For this project you’ll need a large hama bead pegboard (I used a 10.5″ x 14″ board), hama beads in your favorite colors, parchment paper, iron, and a glass. I chose a diamond design that was three beads wide and about 8.5″ long–this was the circumference of a bangle from my jewelry box. Make sure the start and finish of your bracelet end at different angles so they’ll match up when you form the bracelet. 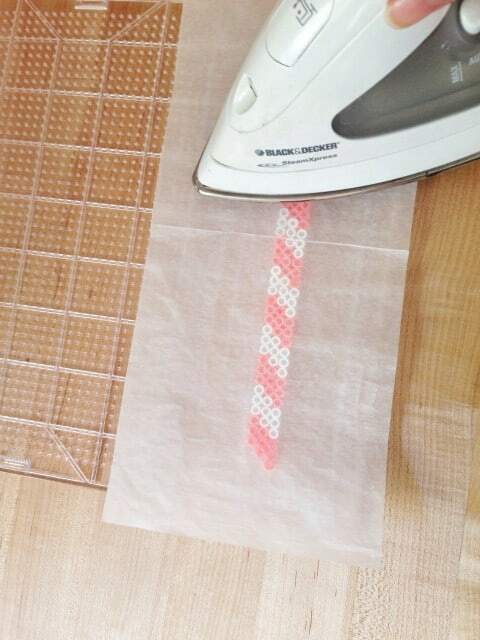 Use your iron to fuse the strip of beads together. Take the strip while it’s still warm and wrap it around your glass, making sure to join the ends together. 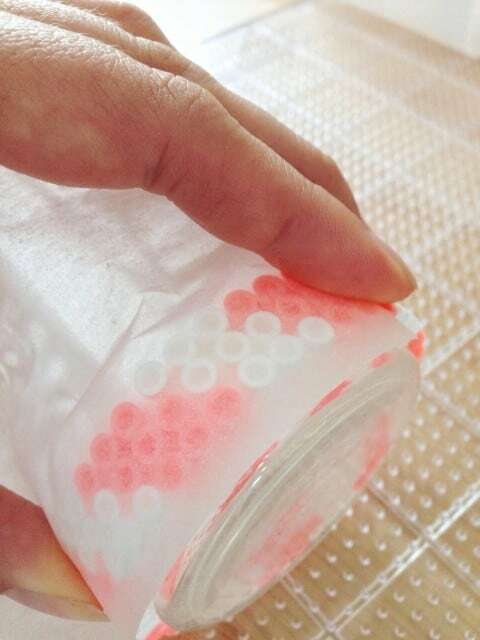 This part can be a bit tricky, but with some finagling, you can fuse the beads together while holding it in place. I found it easier to wrap around with the already fused side touching the glass. 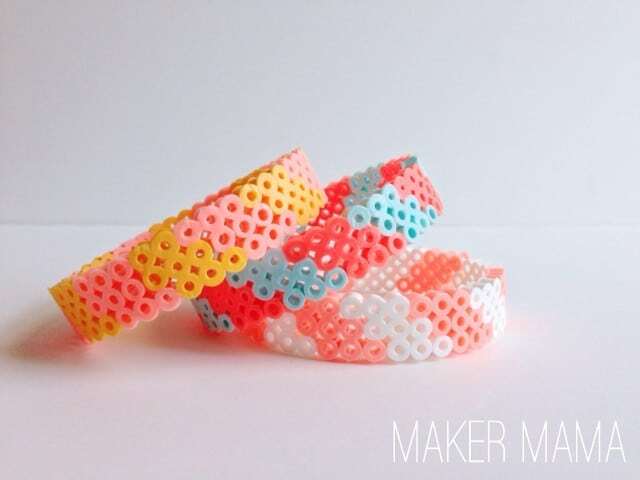 Once you’ve fused the two ends together, work your way around the rest of the bracelet to give it extra hold. 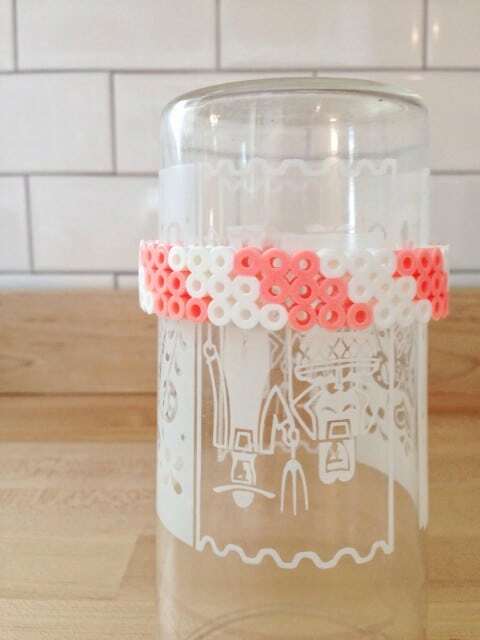 Leave the bracelet to cool on the glass–this will help it keep its shape. Now go to town and make some more! And don’t forget to show them off. 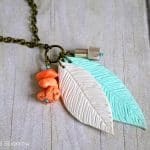 Find more craft ideas on my blog, Maker Mama, and visit me on Facebook and Instagram to see what I’m up to day-to-day! What a great tutorial! 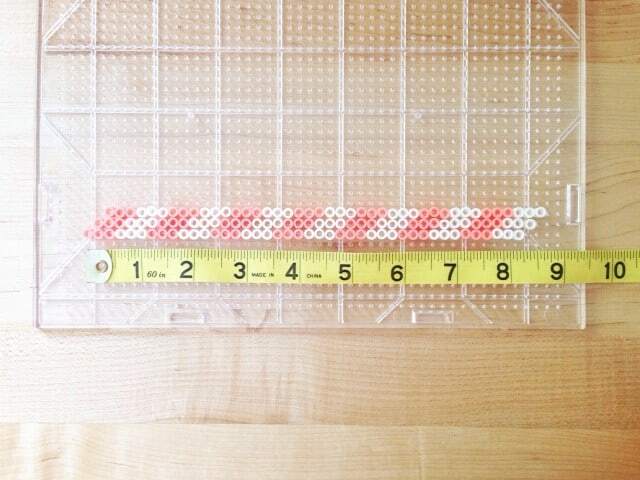 I didn’t know they made peg boards that big! !